Much like my counter part I often seek inspiration in the pages of my old Gourmet, Bon Appetit and Food & Wine magazines. And if nothing peaks my interest there, well, there’s always the Internet. So, as I scoured epicurious.com for the umpteenth time I finally found just what I was looking for. 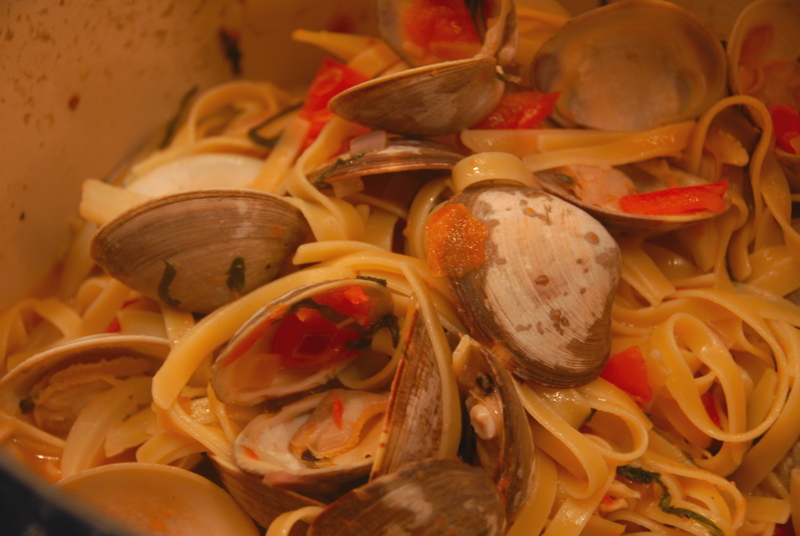 Linguine with clams in a tomato fennel salsa. It sounded fresh and delicious, and while clams are one of my absolute favorite foods I realized I don’t cook with them nearly enough. First published in Bon Appetit in April of ‘97– this recipe is a must try – and not too “fennel-ly” for those opposed. First, be sure the clams are cleaned and scrubbed. Place them in a large bowl with a few spoonfuls of flour and cover with water. Leave them for about a half hour, drain and rinse and they’ll be good to go. 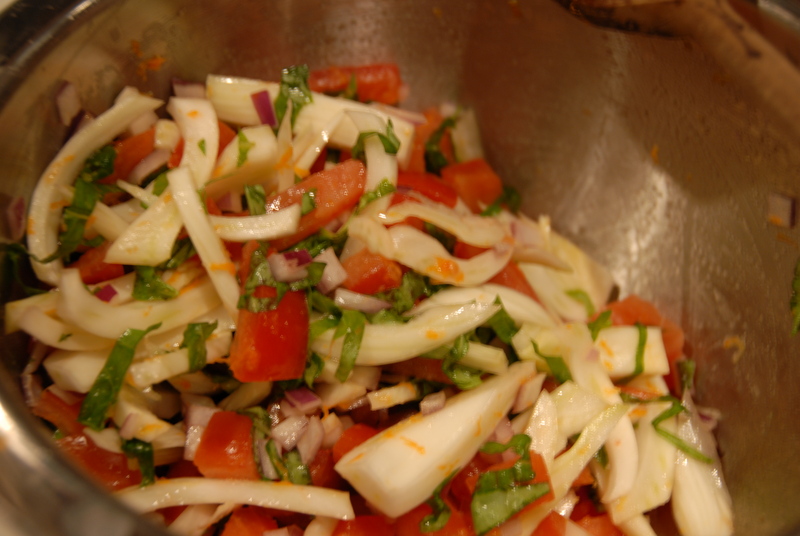 To begin, combine tomatoes, chopped fennel, red onion, basil, olive oil and orange zest in a medium bowl. Season salsa with salt and pepper. Next bring the wine, fennel seeds, salt and garlic to a boil in very large pot. Reduce heat, cover tightly and simmer 10 minutes to blend flavors. Add clams. 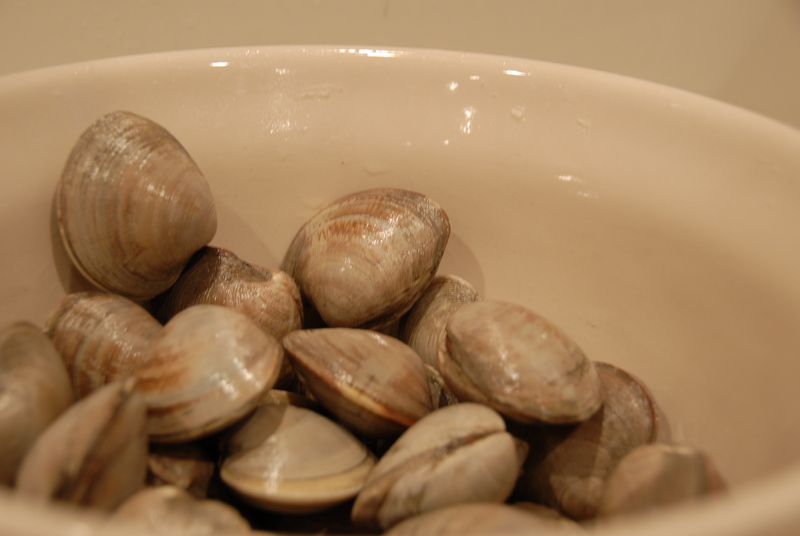 Increase heat to high, cover and cook until clams open, about 7 minutes (discard any clams that do not open.) 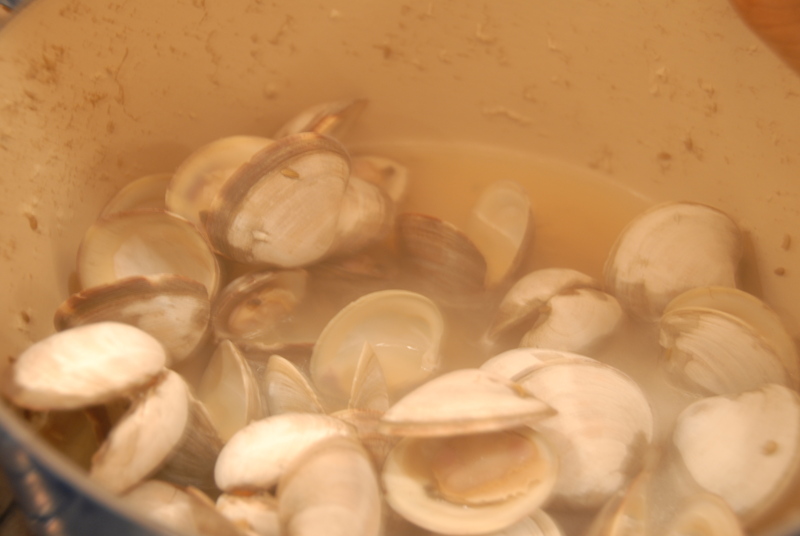 Using a slotted spoon, transfer clams to bowl and strain clam cooking liquid through a fine strainer; return to same pot. Boil until liquid is reduced to 1 2/3 cups, about 7 minutes. Add tomato salsa and bring to a simmer. While the tomato salsa is simmering cook the linguine. As the linguine finishes cooking add the clams back into the large pot, and then add the pasta. Toss till everything is well combined. Relatively simple to throw together, healthy and beyond flavorful – I’m officially obsessed with this dish. Definitely don’t skimp on the orange zest – it really makes the fennel sing! This entry was posted in Fennel and tagged Bon Appetit, clams, fennel, linguine, tomato, white wine. Bookmark the permalink.